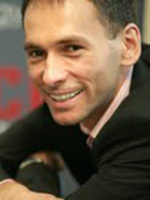 Tomasz Czechowicz is President of the Board of MCI Management, a highly successful investment company in Warsaw, Poland. A source of true entrepreneurial talent, he emerged in the Polish commercial world at a time when the country was just beginning to rise out of the shadows of Soviet control following its independence in the early 1990s. Czechowicz was one of the first graduates from the Carlson School’s Warsaw Executive MBA (WEMBA) program, which began in 1995 as a partnership between the Warsaw School of Economics and the University of Minnesota’s Carlson School of Management. Following his graduation in 1998, Czechowicz used his newly acquired knowledge in management to sell the shares of his first company and use the funds to develop new business ventures in the form of MCI Management. MCI is one of the first companies in Poland to receive capital from the European Union and has grown from an initial investment portfolio of $8 million to $200 million (USD). Known among his peers in Poland and beyond, Czechowicz’s success as an entrepreneur and businessman have earned him many prestigious awards. He was named one of the “top ten most influential people in the European internet” by the European Edition of Business Week, and the title of “Global Leader of Tomorrow” by the World Economic Forum. Since his graduation, he has been a loyal alumnus and has helped the WEMBA program in many ways, including offering project opportunities to students, providing testimonials regarding the program for marketing materials, as well as sponsorship and participation in alumni events. In naming Tomasz Czechowicz as a recipient of the Distinguished Leadership Award for Internationals, the selection committee acknowledges his business success and highlights him as a superb example of the type of impact that the Carlson School and the University of Minnesota hoped to have on the Polish business environment when the Warsaw Executive MBA program was established.